It is funny. It also happens all the time. That's how this works. Credit Harrison Bader with seizing the opportunity and running with it -- and also notice that a lot of other things had to happen for him to rise and take it. Grichuk had to be traded after he didn't run with it -- or didn't a get chance to run with it. I think we can all agree that Piscotty was a different situation, and how that was handled should be something the Cardinals and A's are proud about. No doubt. Baseball is a business. That was human. So all of these things had to happen and Sierra had a run at the role and so on and so on and the guy who grabbed it by the lapels and didn't let go was Bader. Good for him. Caps tipped. He shattered the questions that followed him through the minors about whether he was going to be a corner outfield and whether he was going to hit well enough to be in the corner, or was he going to get the run and instincts in center to allow his game to adapt. He had one of the best arms in the system, good range, and an offensive game that had to advance to reach the majors. He is still in the process of doing that last part. I do my best to make it clear when I'm providing the Cardinals point of view and when I am providing my own opinion, but please know when I provide my own opinion I'm not pulling it out of the clouds and putting it in the chat. I'm pulling it from the reporting I've done to confirm, educate, inform, and support that opinion. Do Mo and Girsch attend all 162 games (barring family emergency, etc.)? They do not. I don't know of a GM who does. That's mainly because they travel to the affiliates at times the Cardinals are on the roads to see how the minors are doing and meet in person with coaches, etc. there. This is something that newspapers are exploring around the country, I know. The KC Star has a sports pass option, for example. The goal of the Post-Dispatch is to provide you with a complete coverage that you want to explore for the cost of the subscription. I get what you're saying about not living in the area and only being interested in the sports coverage or Cardinals coverage. But let's say you're coming to town for a Cardinals series. A subscription would allow you access to Ian Froeb's restaurant reviews and his 100 best restaurants right now in the St. Louis area, and you could add a fine meal to your visit that you learned about from the subscription. That's the idea. We understand the investment you make in the subscription to the entire paper, and I truly feel that it's up to us -- with the Cardinals coverage, for sure, but also with the coverage that can draw you in elsewhere -- to earn it. Tommy Edman was not a scratch from the game. A wrong lineup was posted. Edman is fine. He was available for the game. Do the Cards as an org have a philosophy around the service time manipulation game that other orgs play? Speaking solely as a hyper-rational fan of the laundry, I’d rather have an extra year of Hicks than the eight or so innings he pitched in the first few weeks last year. Does the FO care more about fairness and goodwill than I do as a detached consumer? -- The wins he could influence now were worth the time to the Cardinals. -- If he gets to free agency that year early as a result then the Cardinals have failed on their larger organization philosophy of retaining their own players. 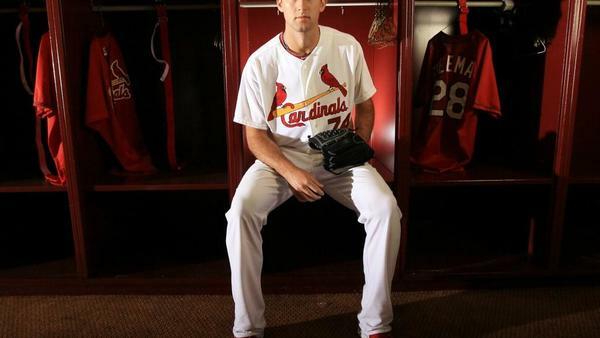 stltoday.comHere's Derrick Goold's user-friendly guide to the Super Two rule, arbitration and options — and how they influence decisions on top prospects. Yes. That's No. 74 Michael Wacha in the picture. Any movement, talk, momentum, whispers that major league contracts will stipulate players under contract are under contract 12 months out of the year? Meaning? Why should owners be on the hook for multi-million dollar contracts and not have considerable input into player off season health, training, and medical issues. With these salaries we should be moving to contracts which require 12 month obligations. Thoughts? No. There hasn't been that. It's a competitive business. If a player chooses not to do what they need to do to be competitive and productive, someone will take his place, tomorrow. That will happen. They don't need to be sequestered for their professional life. At some point it becomes almost dehumanizing. A vacation is good for mental health, too. Really enjoying the chat today. Thanks. It's the questions that make it so. And it's been a wide variety, and pointed. Which is great. It was planned to do that, yes. Shildt said he would be doing it way back in February. He should be able to get a comparable contract from every MLB team that doesn’t already have an all-star at first base. Wouldn’t he then choose whichever team has the best chance of getting to the World Series in the next five years? Or, you know, where he wants to live. Where he wants to play. All of those things. Pena has clearly outplayed Wieters this spring. Doesn't matter though does it? how early in morning do cards begin back field work this week? The minor-leaguers are out there in the morning, shortly after sun-up. The workouts usually start around 9 a.m. Florida time. What level do you expect Carlson and Gorman to start at? Also, what happened with Arozorena on Saturday? He was down for an extended time, stayed in the game, and got a hit that at bat. From the stands I was shocked he stayed in. Carlson is headed to the Texas League. Gorman is earmarked for Peoria. Arozarena was hit on the hand, stayed in the game, got a key single, and then found out today that he had a fractured hand. He'll miss several months. It largely comes from siding with the billionaires over millionaires cliche. So, so, so often I receive complaints about how much players are paid, and rarely do I hear complaints about the owners who are willing to pay them this money, all while knowing that they'll get plenty of revenue in return to make it worth their while. At it's base line, money not paid to players and money not spent on baseball infrastructure -- stadiums, scouting, player development -- is money that goes to the owner. Therefore, if you have an issue with the millions the players make and wish that they made less, then you're suggesting that the owners should make more money. Take home more revenues. The savings aren't going to go to ticket prices. That's not going to happen. I just find it running counter somewhat to the culture. Consider all the big businesses we encounter on a daily basis and the workers they strip of salaries, or lay off, or don't cover their medical benefits -- and how often do you take the side of the big business over the little guy? Maybe it's more and more in our culture, but it's so often in baseball. And I get the little guy in some cases is making millions. Fine. But in this market the middle-class player is also getting squeezed out. The reaction to Jack Flaherty's situation is an example. I saw some hand-wringing about how much the Cardinals were paying him -- when they got a $10,000 rebate on his salary. Is that really going to make a dent in their revenue this season? Really? Is that going to allow them to rehire a recent firing or give a scout a $10,000 raise because Flaherty isn't getting it? No, that is $10,000 not spent. And to not take the players side in that seems off to me. Owners are important, no doubt. Some run in the red to operate a team; not all do. But I don't remember the last owner baseball card my son came home with, or the last owner jersey I saw sold at a team store. Just seems odd that in some corners the default is to wonder why the players make millions and not why the owners make more millions. As for what gets them to the table to avoid a stoppage -- we're seeing that happen in real time -- and one of the driving forces behind it is what we just talked about: Money is flowing into the game. It's healthy. Overall, it's healthy. It is. And the players don't want to lose a year's salary to that, and the owners don't want to part with the stream of revenue as a result of it. It's not at the point at all like it was with hockey, when a lockout made financial sense for some teams 15 years ago. It would allow them to reset, thrive. Baseball is booming in many many ways. Both side feels the pressure not to mess with that. Is Fowler's avg exit velocity this spring made available? Not publicly. Reporting and sources have pulled that information out. Other than Goldschmidt, the starting eight is basically the same as last year. If they have the same results as last year, isn't it time to move from some these players and start a rebuild? Yep. And that's probably what will happen. Cardinals will pivot. Hi Derrick. I was wondering your thoughts on the three batter minimum rule. What does the union think of that? Seems like eliminating specialists would be worse for players than adding a DH would help. My opinion: It's a farce. It is treating a head cold with an amputation. It is, at best, a misdirection from the real issues slowing down the pace of the game, and at worst it's something that will cause more trouble than its worth, because it's not worth much, so any trouble it causes is worse. Widen the strike zone. Put it down two inches. Below the kneecap. At the cuff. Something. Lower the strike zone, call it on the black again, and watch the hitters and pitchers adjust and grounders hop around and the pace of play pick up. Simple. The union is not happy that it's being unilaterally implemented. How concerned should we be with Andrew Miller's performance right now? It's not looking good. Will this be more dead money after this season? Shouldn't be at all. He threw 30 pitches in a quick set of innings on the back field and sped through the Class AAA lineup from the Marlins. He was fine. MLB hitters would have had the same chance. He had two rocky outings at night against Houston with runners on base. There's a root cause for his issues. He's got that sorted out. I've seen nothing but negative responses to the new 3-batter rule. Do you think that might just become a bargaining chip to trade for say a pitch clock? If everyone hates it why force it down their throats. Probably not. My fear is it's hear to stay, with the mess it might cause. What was your favorite Cardinal team you’ve covered? Thanks! In hindsight, the 2011 team provided some of the best stories I'll ever have the chance to write and the stories that I hope brought out the best in me. I owed it to what we watched that team accomplish -- and what it has come to mean as the last hurrah of La Russa, Duncan, and Pujols.